Maybe tomorrow… I’m busy with a glass of ‘vine fruit’ at the moment! Ooooh, lotsa work in them there baskets! 🙂 Good friends and I hope the wine is also good! I’ve made some progress now… although I’m only about half way through I think! Vino? With all those apples there. You should be on the cider now along with all the apple pies you’ll be making. Just couldn’t wait for the cider to be ready! Oh, envious! Do you know, you can’t get Bramleys here? The only ‘cooking’ apple available is Granny Smith. And despite my good fortune with the more exotic fruit, I’d still love to have a nice batch of apple sauce, juice and chunks in the freezer. Oh, and I’d make appelstroop too, by boiling juice down until it was black and tarry and delicious, a traditional Dutch treat. We really want to know what variety these apples are… I know an apple expert, but of course I never have one of them with me when I see him. I am going to investigate appelstroop – it sounds fantastic! It is! Tart but sweet. It looks like Marmite, but smells and tastes much better! Ooooh that Is awesome! What’re you planning to do with all the apples? Or are you too focused on peeling to have thought about the next stage?! I’m mainly bottling, but I think I’m going to make some chutney, some chilli jelly and I really fancy the idea of appelstroop that Kate mentions above. Do you peel/chop them by hand? I found that this kind of device made my apple-processing way faster- http://www.lakeland.co.uk/13181/Apple-Master (mine was from a charity shop for a fraction of that price though!). No apples here yet, I’m still drowning in raspberries. 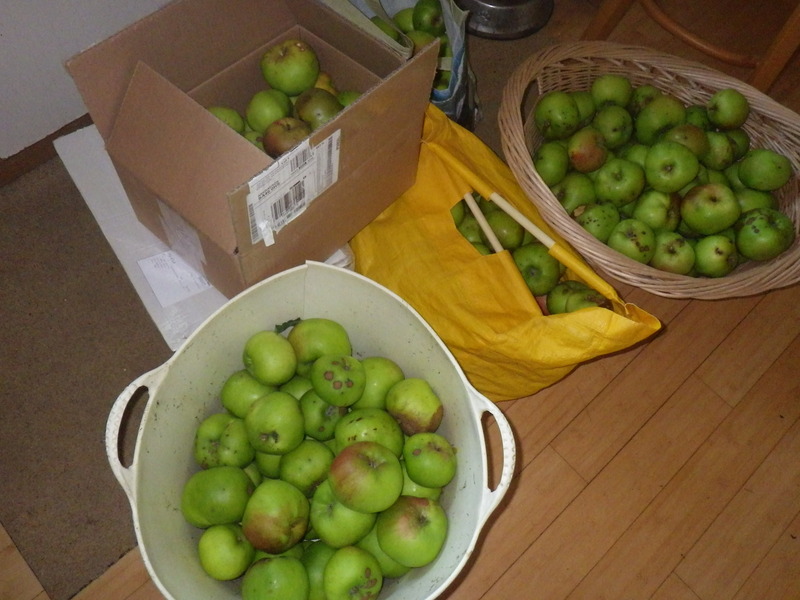 I’ve seen the apple peelers before, but they are so expensive… so it’s still all done by hand here chez snail! Your share of Old Faithful’s harvest is magnificent. Gorgeous appley futures. Can’t wait to sniff out the apple blog posts of the future. I was just gifted a gorgeous Ballerina apple tree for inside Sanctuary by a good friend that we gave most of our much loved potted rare conifers to. Much more practical for Serendipity Farm and although it was sad to wave goodbye to a collection that has taken us years to amass (and no small fortune) we know our limits out here and have finally decided to let them go where they can actually be planted out and have a future. Now…on to those apples! I really hope your Ballerina flourishes in Sanctuary. Am I right in thinking that Tasmania is a great place to grow apples? The picture of the kitchen was carefully composed to omit the dogs, hair, mugs, plates, axe, mud and general chaos! Such bounty! I was just driving by local orchards yesterday, marveling at how much fruit was on the trees–it must’ve been a great year for the growers! It does seem to have been the most fantastic year for all sorts of fruit. We picked loads of blackberries the other day and so the freezer is bulging… hence the need to bottle the apples rather than freeze them (not to mention the fact that I still have some from last year in there which I really should use up). What a big splendid tree, I wonder how old it is. We were discussing its age whilst we were picking. It’s quite difficult to tell with fruit trees because of the way they are managed, but I think it could be 60-80 years perhaps. Apples are currently the bane of my existence right now. And elderberries. I don’t know what it is about this year, but all 4 trees (2 of each) have gone fruit-bearing mad. I am trying to focus only on apples at the moment. I’ve stopped picking blackberries lest my freezer explode!